The loss of David Warner and Shane Watson give England a chance of ruining Australia’s remarkable recent one day record – P19 W18. But they will also have to deal better with Mitchell Starc’s and Pat Cummins’ extra pace – possibly augmented by James Pattinson. Both Starc and Cummins have been regularly touching 92mph and make excellent use of the bouncer (especially Cummins.) This has two effects. 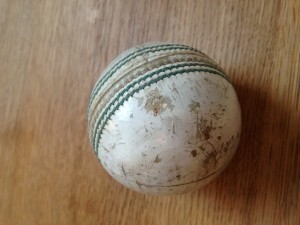 It stops the batsmen taking liberties (or running up the pitch.) Also it bashes the life out of the Kookaburra ball (which is soft anyway as illustrated in the picture of a ball from the last game.) This means it bounces unpredictably (often lower than expected) and is harder to hit long distances. Australia have hit 11 sixes in the two matches to England’s six. Australia are particularly good with bat and ball in the overs after the 30th. They use reverse swing., variations of pace, quick yorkers and awkward bouncers with Glenn Maxwell bowling his off-spin darts at the other end. England’s spinners are a bit slower and go for more runs. And batsmen like Mitchell Marsh, Glenn Maxwell and Shane Watson pulverize the ball in those later overs. England haven’t quite found the man to do that. It is not Chris Woakes or Moeen Ali (who might be better off up the order.) It might be David Willey or Sam Bilings.. It’d be good to see one of them have a go. But they’ll need super quick reactions!